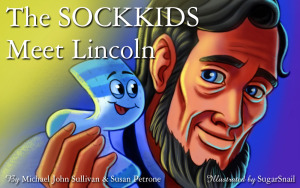 The SockKids Meet Lincoln by Sullivan and Petrone Free on Amazon This Weekend! This weekend is the last opportunity to download FREE The SOCKKIDS Meet Lincoln for your Kindle. The SockKids – Solving The Mystery Of Your Missing Socks! Where do our missing socks go? Readers find out in the children’s series, The SOCKKIDS. We follow the Socker family through many adventures; from encountering the slobbery mouth of the family dog to meeting Santa as he comes down the chimney on Christmas Eve to helping a fireman save a baby to the most shy Socker going to the school dance for the first time. Thanks to the time-travel opportunities afforded by the spin cycle of the washer, they learn about some of the most important humans in the world. Children two and up and their parents will be drawn to the diversity of the family and the universal and timeless lessons they teach: don’t be afraid of new experiences; treat others as you would like to be treated, and of course, beware of the spin cycle! The SockKids – Helping Humans Cope in a Smelly World!